After the war he was the first US minister to England. 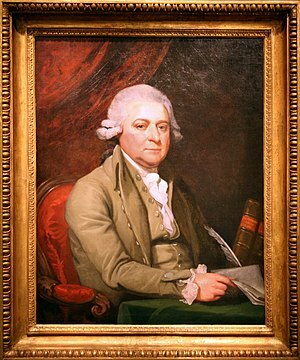 In 1787 He wrote Defence of the Constitutions of Government of the United States of America, that called for a strong Executive branch that would act as “father and protector” of the nation. When Washington announced that he would retire after his second term the first contested American Presidential election took place. It was four man race with the Federalist nominating Adams and Thomas Pinckney of South Carolina, and the Democratic-Republicans nominating Thomas Jefferson and Aaron Burr. Jefferson was labeled a Francophile, a coward and an atheist. 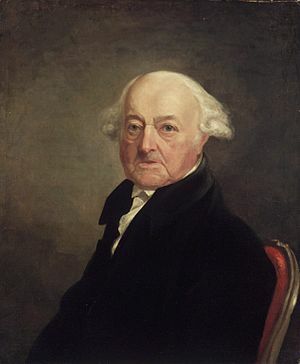 “Adams was portrayed as a monarchist and an Anglophile who was secretly bent on establishing a family dynasty by having his son succeed him as President.” [Miller Center.org] Adams won by three votes; Jefferson came in second, making him Vice President. Adams sent commissioners to France, but Paris refused to meet with them unless they paid a bribe. “Adams reported the insult to Congress, and the Senate printed the correspondence, in which the Frenchmen were referred to only as “X, Y, and Z.”” [Ibid] The X,Y,Z affair increased Adam’s and the Federalist’s popularity. Congress passed the Alien and Sedition act and funded three new frigates for the navy. The US had some spectacular victories at sea and France sent word that it would now receive an envoy (this time without a bribe). Negotiations ensued and the quasi war ended. But by sending an envoy to France to sue for peace the Adams Administration infuriated the Democratic-Republicans. The Federalist were weakened. Washington’s death in 1799 hurt the party even more. In the 1800 Election Jefferson won the electoral vote by 8 votes. In retirement he moved back to Massachusetts to his farm at Peacefield. 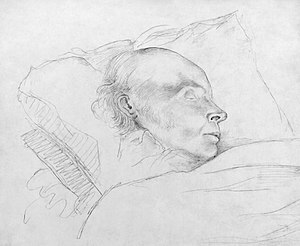 He did not attend Jefferson’s inauguration (Adam’s son Charles had just died and he was anxious to get home). 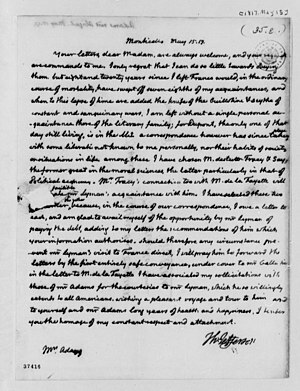 John Adams wrote his biography (which he did not complete) in which he addressed everything “from the nature of his manure piles at the farm to history and political philosophy.” [Ibid] In 1812 He and Jefferson renewed their friendship through an exchange of letters that lasted for 14 years. The two men died on the same day, July 4th 1826. This entry was posted on Tuesday, October 30th, 2012 at 5:59 pm	and posted in American History, History, Patriotic, postaday, Thought of the Day, Today's Birthday, Uncategorized, United States. You can follow any responses to this entry through the RSS 2.0 feed.